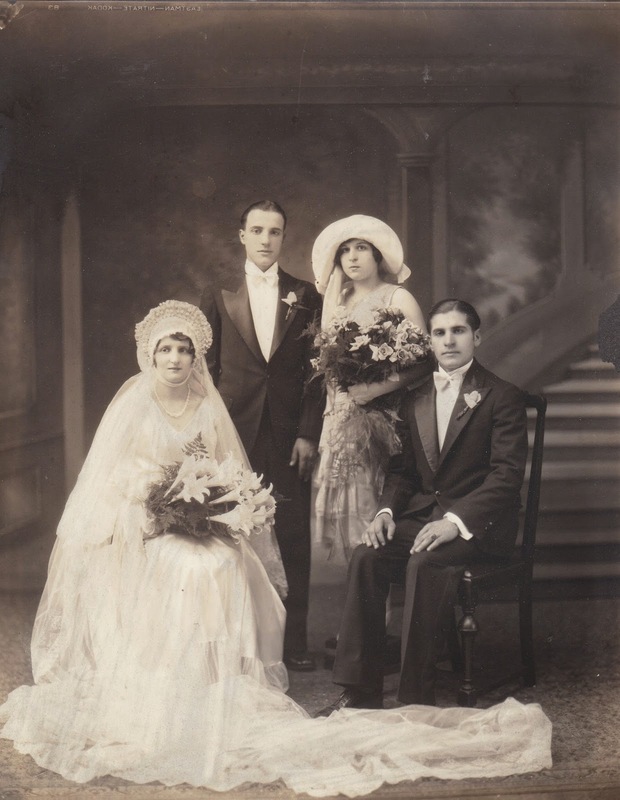 Throwback Thursday " A Vintage Wedding"
I am really excited about this new feature on the blog. I just love vintage photographs, and I am going to mix up this segment by adding some of my personal family photos for you. My Mother was the youngest of 7 children. She had me in the days when having children in your 40's was not normal. So I feel good that it is now "the trend" with women working and having children later in life. My Mom has always been mistaken for my grandmother, or great-grandmother. Because of such an age gap, I have wonderful vintage photographs of my Aunts and Uncles, as well as Grandparents. This photo is my Aunt Lenny and Uncle Jimmy's wedding. My other Aunt Anna was her Maid of Honor. I believe this was in the 1930's era. The flowers are just amazing, such large beautiful bouquets. My Aunt's wedding gown is really just so elegant. My Uncle always felt he looked like the silent film star, Rudolph Valentino, and I have to agree with him! A very handsome man!